Do you need to buy a fixed snap shackle? Then why not purchase one of our range of shackles, all conveniently listed here for your perusal at Rope Services Direct. 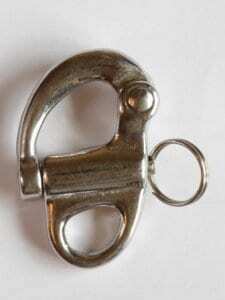 You’re bound to find a shackle ideal for your requirements. The fixed snap shackle is highly popular in the marine industry in preventors, halyards, up-hauls, down-hauls and out-hauls. Also popular in yachting, they simply attach to fibre ropes or wire ropes and are highly safe and secure. Our fixed snap shackles are simple to use and create a really good connection. The central pin is pulled out slightly to release the swivel hinged opening, when your chosen product is fitted, the opening bar can be pushed down to close and the pin re-located to lock back into place securely. These shackles are manufactured with 316 grade marine metal. They are available in a variety of sizes. If you can’t find what you are looking for – just ask. When buying this shackle, it’s critical to determine the load you expect it to bear as they each have a clearly defined limit. Our range of sizes include 52/66/96mm overall lengths. Each shackle is specifically designed to resist and protect against corrosion and rest. This is even the case when there is adverse weather, sea air or salt water conditions. Ready to give us your order for a fixed snap shackle? We provide fixed snap shackles with options for sizes and loading limits. To order or let us know what you need, all you need to do is fill out a rapid contact form. For helpful advice and a friendly person to speak to about these shackles, call 01384 78004 today. Fixed Snap Shackle Overall rating: 5 out of 5 based on 6 reviews.